North Korea admitted its much hyped long-range rocket failed to deliver a satellite into orbit on Friday while American and South Korean officials said it crashed into the sea a few minutes after launch, dealing a blow to the reclusive state. Pyongyang had defied international pressure from the United States, the United Nations and others to push ahead with the launch timed to celebrate the 100th birthday of Kim Il-sung, the deceased founder of the state, and to coincide with the ascent to power of his grandson Kim Jong-un. Even close ally China had warned against the launch and South Korean intelligence officials have said North Korea may be ready to follow it up with a nuclear test as it did after a rocket launch in 2009, even though it could face more United Nations sanctions if it did. "The earth observation satellite failed to enter its preset orbit," a newsreader said on North Korea's state TV. "Scientists, technicians and experts are now looking into the cause of the failure." The attempted launch stirred a storm around the world, EU foreign affairs chief Catherine Ashton calling it a "clear violation" of a resolution issued by the UN Security Council. "The attempted launch today is a clear violation of North Korea's international obligations as stipulated by resolution 1874 of the Security Council, which requires North Korea to give up any ballistic rocket capabilities," Ashton said in a statement. Meanwhile, Russia, China and India agreed on the need for restraint and an exclusively political, diplomatic response to North Korea's failed rocket launch, Russian Foreign Minister Sergei Lavrov said on Friday. "We do not believe in new sanctions - they will not do anything in terms of resolving the situation," Lavrov said after talks with this Chinese and Indian counterparts. It was an unusual admission of failure by the unpredictable regime, since it will be seen by its 23 million people who are only given access to state-controlled news sources. A similarly-failed launch in 2009 was touted by the North as a success. Friday's launch breached the terms of a recent aid deal struck with the United States as well as United Nations sanctions. Washington, Tokyo and Seoul issued sharp rebukes and said they would step up cooperation and vigilance. "Despite the failure of its attempted missile launch, North Korea's provocative action threatens regional security, violates international law and contravenes its own recent commitments," White House spokesman Jay Carney said in a statement. The Interfax news agency cited an unidentified Russian Foreign Ministry official as saying that North Korea's rocket launch contradicts a UN Security Council resolution. North Korea said it wanted the Unha-3 rocket to put a weather satellite into orbit, although critics believed it was designed to enhance its capacity to design a ballistic missile to deliver a nuclear warhead capable of hitting the continental United States. The rocket crashed in a sea that separates the Korean peninsula from China off the west coast of South Korea after flying 120 km (75 miles) from its launch site close to the Chinese border, officials in Seoul, Washington and Tokyo said. The North American Aerospace Defense Command, NORAD, said the first stage fell into the sea west of South Korea, and the remainder of the satellite-carrying missile was deemed to have failed. "No debris fell on land," NORAD said. "At no time was the missile or the resultant debris a threat. The world's most militarized border separates North and South Korea and the two states remain technically at war after an armistice ended the Korea n War in 1953. 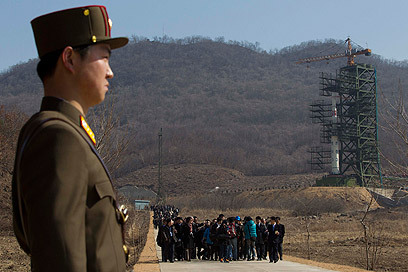 South Korea said it was dispatching ships to try to retrieve the rocket, which it said split into 20 fragments as the first and second stages failed to separate, showing that the new rocket had failed to travel as far as the previous one in 2009. 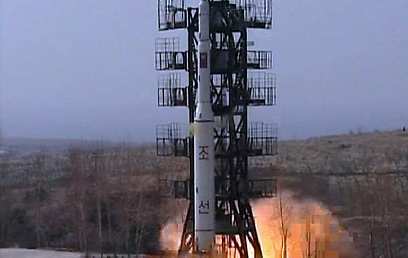 See all talkbacks "N. Korea suffers major blow as rocket crashes "